84 yo M with history of a “valve problem” presented for sudden onset chest pain and trouble breathing while eating lunch. He was sitting bolt upright, diaphoretic, tachypneic, with bilateral crackles. Although his BP was 126/84, he was in acute cardiogenic shock. Sinus tach with occasional PACs. Relatively normal QRS complex with diffuse significant ST depression including leads V2-V6, I, aVL, II, III, and aVF, with ST elevation in aVR. The vector of ST depression is maximal in leads V5 and II, consistent with diffuse subendocardial ischemia. There is no evidence of any single vessel OMI (Occlusion MI). This is not consistent with posterior OMI, which would have ST depression maximal in V2-V4 usually without diffuse ST depression. The ECG does not differentiate the above etiologies, it simply signifies that there is severe diffuse global supply-demand mismatch, whatever the etiology. 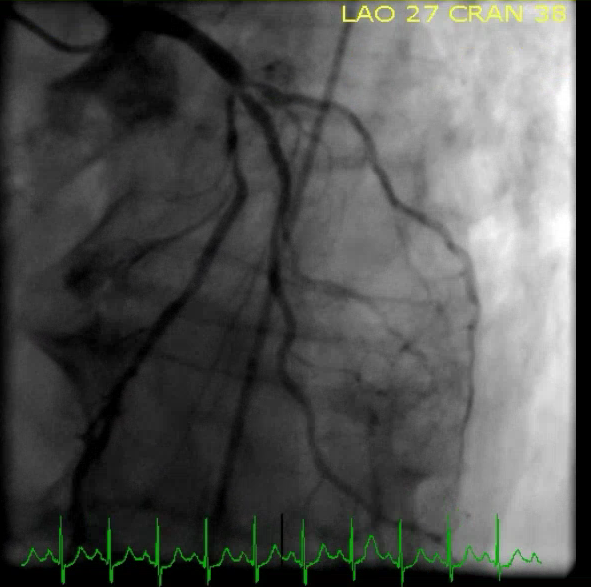 Bedside ultrasound revealed significant LVH and an extremely bright, dense, nearly non-moving aortic valve (video not available). It seems as though the angiographers were unsure whether any of these lesions represented acute ACS or whether they were pre-existing without acute ACS. 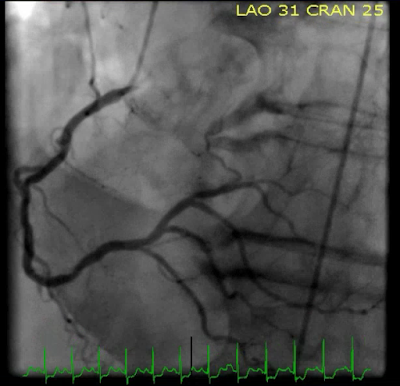 The left main ends with a trifurcation (LAD, Ramus, LCX) that shows a severe stenosis at ostia of all three vessels. This is the "spider view" of the same lesion. Diseased but grossly patent RCA. The max troponin T was 2.40 ng/mL. 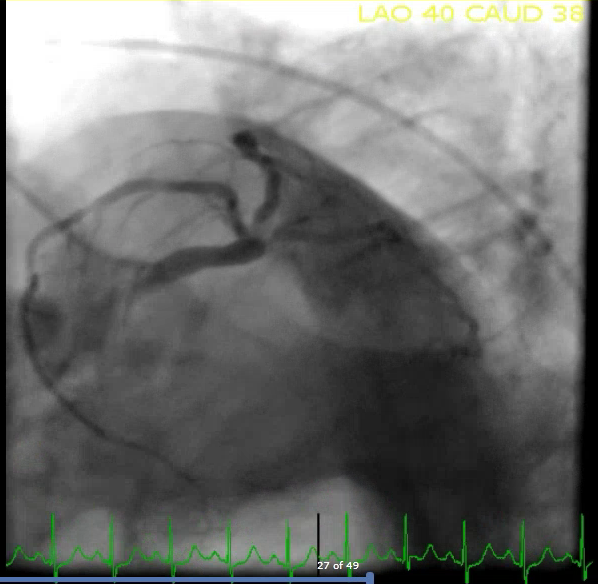 The patient required urgent bioprosthetic aortic valve replacement and CABG including LIMA to LAD, SVG to ramus, and SVG to OM1. Diffuse ST depression maximal in V4-V6 and lead II, with ST elevation in aVR, signifies diffuse subendocardial ischemia. Some etiologies of diffuse subendocardial ischemia, including unstable 3-vessel or left main ACS likely benefit from emergent revascularization, whereas other etiologies of global demand such as sepsis, hypotension, GI bleeding do not. Great job by Dr. Pendell Meyers presenting this case! I have little to add to his excellent clinical content! However, I would like to emphasize how this case provides a wonderful example of “pattern recognition”. By this, I mean that when the emergency provider sees a “pattern” on ECG (as we do in ECG #1 in Figure-1) — that you should be able to instantly know what this pattern means — and instantly know the differential diagnosis to consider. Diffuse ST depression in multiple (that is, ≥7) leads, in association with ST elevation in lead aVR (and sometimes to a lesser extent, ST elevation also in lead V1) — means subendocardial ischemia. The differential diagnosis for diffuse subendocardial ischemia was noted above by Dr. Meyers. I’ll mention having on occasion seen this ECG pattern in fast SVT rhythms — with resolution (or near resolution) of ST depression on conversion to sinus rhythm, with no significant coronary disease found on cath. Other, non-cardiac potentially reversible conditions (ie, severe anemia, sepsis, very sick patient) may also occasionally produce this ECG pattern. But, in an older adult with new-onset chest discomfort (as is the case here) — this ECG pattern almost always means that the patient has severe coronary disease (left-main, proximal LAD narrowing and/or advanced multi-vessel disease). MORAL: Memorize the ECG pattern shown in ECG #1 in Figure-1. Be sure to recognize this pattern as indicative of diffuse subendocardial ischemia, with need to promptly determine the cause. Figure-1: The 2 ECGs recorded in this case (See text). 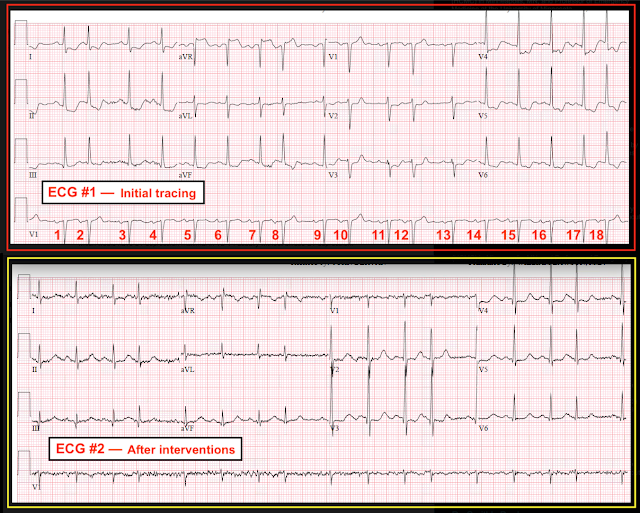 Additional Interesting Observations about the ECGs in Figure-1? I’ll preface my remarks by saying that the observations I note below do not alter clinical management. That said, they are interesting findings that the astute interpreter should pick up. ECG #1 — As per Dr. Meyers, the underlying rhythm is sinus tachycardia with PACs. Did You Notice in the long lead V1 rhythm strip — that the T wave of each PAC (ie, beats #2,8,10,12 and 18) is different (more peaked) than the T wave of all of the other beats that are sinus conducted? I fully acknowledge that I am not certain why this is so — but it is a definite reproducible phenomenon that the astute interpreter should pick up. Comparison between ECG #1 and ECG #2 — The important clinical finding that should be recognized is dramatic reduction in the amount of ST depression in multiple leads in ECG #2 after intervention. There is also considerably less ST elevation in lead aVR. Despite the increase in baseline artifact — there should be no doubt that successful treatment in this case correlated to reduction in the amount of ST depression. Did You Notice slight change in frontal plane axis (from +75 degrees in ECG #1 — to +50 degrees in ECG #2) — and, marked change in transition and chest lead QRS morphology? Specifically, transition in the chest leads does not occur until between V3-to-V4 in ECG #1 — whereas in ECG #2, there is already a dominant R wave (as well as small q waves) by lead V2. The reason for this dramatic change in chest lead QRS morphology is not apparent. Perhaps it is due to open-heart surgery, with need to alter the position of chest lead placement? Clinically, the reduction in ST depression between ECG #1 and ECG #2 is so great, that regardless of this change in QRS morphology — we are confident this improvement in ECG appearance is reflective of successful treatment. But, it is important when comparing tracings to recognize changes in frontal plane axis and chest lead morphology — because sometimes less marked differences in ST-T wave appearance may be due to these technical factors rather than a change in the severity of ischemic findings.